A palette is a range of different colors. 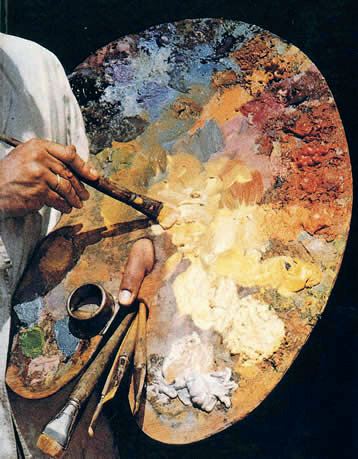 Even more abstractly, a palette is a range of different talents or techniques. I'll quote my cousin Claudia, who recently explained: "...palette. That's what an artist has. A palate is the roof of your mouth. A pallet is a bed made of blankets on the floor, or one of those things forklifts pick up." Talk about a "color palette," "someone's palette," or a "palette of something:" "Let's update the color palette of our living room." "Black clothing just isn't in her palette." "He wants to expand his palette of site design skills." You can also stick an adjective before "palette," as in "emotional palette," "musical palette," and "rich palette." Were you impressed with Lady Gaga's musical palette when she suddenly dropped the dance pop stuff and sang show tunes? His technical palette is extremely limited; I don't recommend hiring him. Look away from the screen to explain the definition in your own words. You’ll know you understand what "palette” means when you can explain it without saying “range” or “set." Think of something you like that comes in different colors, and fill in the blanks: "_____ comes in a _____ palette of colors." Example: "The Honda CRV comes in a limited palette of colors, but it's a very reliable car." All of the questions this month come from the nifty board game MooT, the game of semantics, etymology, and grammar. These questions were written by fellow language enthusiast Jon Steeves, the game's creator. Try a question each day, and see the correct answer the next day. Good luck! According to the Online Etymology Dictionary, what American city's name was perhaps coined as a corruption of the French phrase “beau fleuve,” beautiful river? Answer: Buffalo. Originally, it denoted a just-fired bullet. Eventually, it came to denote a flashy male dresser. Nowadays it labels any flashily successful person. What two-syllable word is it? 2. All her songs sound exactly the same to me. She really needs to _____ her palette.